This comprehensive text explains the diagnostic and optometric management procedures involved in the care of patients with binocular vision anomalies. 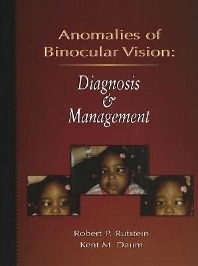 Provides thorough descriptions of the many binocular vision anomalies, describes the necessary testing procedures to correctly diagnose each disorder, and suggests the most appropriate management. Every topic area in binocular vision anomalies is included, from heterophoria and accommodative disorders to severe strabismic disorders. Discusses not only the most common forms of treatment for a particular anomaly, but also discusses less known but deserving treatment alternatives, providing the reader with an understanding of the full range of treatment possibilities. In each chapter, an anomaly is identified, then classified according to its significant symptoms and clinical findings. Once a diagnosis is certain, the appropriate forms of treatment are discussed. Editors Rutstein and Daum are well known and respected in their field. They are scientists who have lectured extensively, have written many articles and have a wealth of clinical experience. Organized to take the reader from the base to the tip of the "pyramid" of binocular vision. Sensory anomalies are discussed first, integrative anomalies next, and motor anomalies last. An invaluable reference for both optometrists and ophthalmologists. Features many references and case studies. Contains approximately 309 illustrations and photographs, providing the reader with a clear, visual guide to the disorders and their management. Features clinical pearls succinct bits of "clinical wisdom" that are boxed within the text for easy reference. Outlines appear at the beginning of each chapter, giving the reader a quick overview of chapter content. Glossary appears at the end of the book, defining key words that appear in the text.